The Arboricultural Association is an industry lead body in the world of tree surgery. By choosing an Arb Association Approved Contractor you are affording yourself peace of mind that your job will be carried out by a company that has undergone a rigorous examination of everything from quality of work to office procedures, health and safety to continual professional development. The Arb Association is a registered member of SSIP (Safety Schemes in Procurement) offers a recognised benchmark for arboricultural contracting throughout the UK and Ireland and is increasingly required by Local Authorities and other large commercial organisations. ARB Approved Contractor is also of benefit in the domestic sector as a quality mark assuring the client of good quality tree care undertaken safely and efficiently. 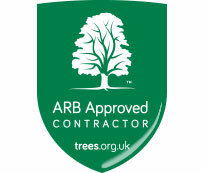 Here at Howdens Tree Surgery Ltd. we take great pride in our Arb Approved Contractor status and endeavour to carry out every job with this in mind. ArbAC means choosing a service which operate to the highest industry standards! Tree owners can rely on an ArbAC for appropriate advice and services. They’re regularly tested (every 2 years) by the Arboricultural Association to ensure that their operations on-site are at the highest standard. They’re checked for professional business management, paperwork and customer liaison processes to ensure high levels of service are given. Their staff are fully qualified and highly skilled and have a continual training programme in place. Tree work is carried out to British Standards 3998:2010 Recommendation for Tree Work. They operate safely with appropriate protective clothing and equipment that is regularly tested and maintained and is fit for use. Are CHAS Accredited – which means they are regularly assessed to ensure that all its operations and procedures are to Health & Safety Executive and industry requirements. Are Safe Contractor Accredited - a leading health and safety pre-qualification assessment scheme, dedicated to promoting higher standards of competence and compliance within specific industrys. They’re up-to-date with industry changes and implement those within the business if necessary. Have the relevant and appropriate communication methods and procedures in place. An ArbAC has shown quality tree care and has been assessed and approved by the nation’s largest representative arboricultural body. Visit www.trees.org.uk for more information.